Local Chat This is where you talk to everyone in a 20m radius. Click on the communicate button on the bottom left of the screen and type what you want others to hear (read). If you click on the say/shout drop box (to the right of where you type), then anyone that is within 100m will hear what you have to say. Instant Message (IM) This is where you can have a one to one conversation with someone whever they are in Second Life, they don't have to be in the same location. To do this, if they are a friend, go to your friends list (on the left side of Local Chat is another tab called Contacts). Click on this tab and anyone that is online will have their name in bold. Click on their near and then click on Instant Message button and start talking. If someone's name is grey, that means they are not online - you can still send a message to them and they will get it next time they come online and if they have elected to receive IM emails when they are not online, they will receive an email containing the message (asynchronous communication). Group Chat When you join a group or a community you are able to communicate easily to group members in that group. Group chat is useful so that group members can talk to each other regardless of where they are. You can also receive group messages through emails if you elect to do so. To talk in group chat, if it is not already a tab on the Communications Window, go to your Contacts tab (to the left of Local Chat) and at the top, choose the groups tab. Then, select the group that you want to talk to and choose IM. Make sure your computer has a sound card, microphone and speakers. Test with music. Next, test your microphone. When you are confident these work, then you are able to enable sound in Second Life. You can also click on the "Push-to-Talk in toggle mode" button. This means that you will only talk when you want to. This prevents feedback when more than one person's microphone is turned on. It is also Second Life ettiquite (one person talking at a time). You need to choose the key you want to toggle talking on and off. 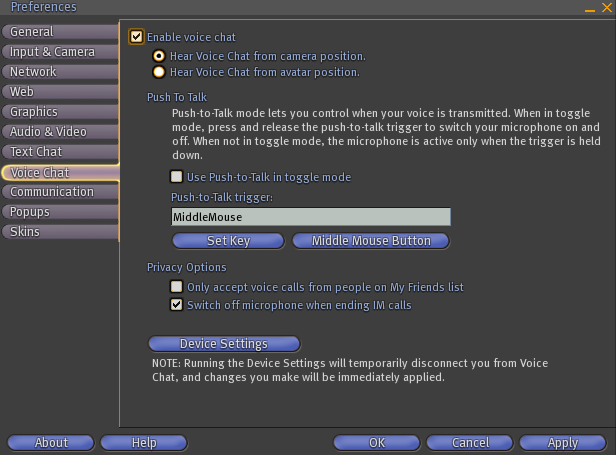 You may not have a "middle mouse" so choose a key that is not commonly used, otherwise when talking in chat mode (typing) you will be turning your microphone on and off all the time. When audio is enabled, holding down the designated key turns your microphone on enabling you to speak. As an alternate to having a toggle button to use the microphone, you can use the "Talk" button on the Voice tab. When you hold down this button you are able to talk. The button will turn yellow when pressed - this let's you know it is working. There is a lock button to the left of the "talk" button. Theis enables you to lock on/off the talking mode (microphone). To two speach bubbles enables you to see who is speaking and the final button is the volume control.